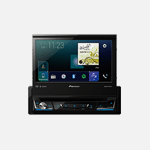 Remember to ask for Pioneer warranty during your purchase to enjoy our comprehensive services on your products. For visitors from other countries not listed, please click on Global Link to find your local support and contact information. For visitors from other parts of Asia, please select a country.